Oh, Brother! - Family Times is an award-winning magazine with staff-written news, feature stories and artwork that inform and inspire Central New York parents and their children. Sibling rivalry is competition, jealousy and fighting among brothers and sisters. It is normal but can be a major headache for parents. In our practices, we often get questions from parents about how to manage the conflict between their children. When do I intervene? Should I get involved at all, or make them work it out? How can I promote cooperation, empathy and understanding among my children? Siblings argue and fight for many reasons. It’s also common for sibling relationships to range on a continuum from adoration to loathing. Children experience jealousy and competition in their relationship, which leads to arguments. Developmental stages. Your children’s ages and developmental stages will have a lot to do with how well they get along. For example, toddlers are quite possessive of their belongings. A toddler can become angry if a sibling uses or even touches her toys. Children in the elementary grades are concrete in their thinking and have a strong sense of fairness. This stage makes it difficult for a child to understand why siblings of different ages have different bedtimes or chores. A sense of unfairness can fuel sibling conflict. Individual differences. 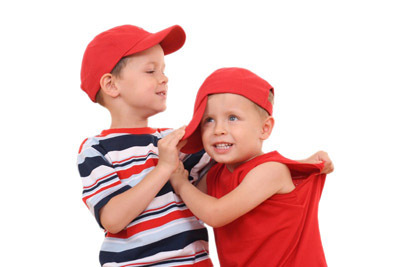 A child’s temperament will largely define how he reacts to conflict of all types, including sibling rivalry. An easygoing child reacts very differently to teasing than one with a competitive nature. Family stress. High levels of parental stress can increase sibling fighting. As the adults feel increased demands, their time, attention and patience decrease. Children often react to this with increasing amounts of conflict within the sibling relationships. The stress level of the children themselves also contributes. If a child is feeling the pressure of school performance, a sports team (or two) and piano lessons, she is likely to have a shorter fuse. Role models. Children observe all adults in their lives, but none more intently than their parents. How adults manage their own conflicts affects how children cope with their disagreements. While sibling rivalry might be the norm, many parents are unsure how to minimize the occurrences, or what to do when they happen. Here are some guidelines to help. When to get involved. Most sibling disagreements call for a “watch and wait” attitude from parents. Pay attention to the interactions between children. Notice patterns in timing, topics and other influences. When parents jump into sibling fights too quickly, they risk creating even more conflicts. Children learn arguments bring parental attention and will do it for that reason alone. If an argument escalates to physical fighting, or leads to a situation in which a child might be hurt, intervene immediately. Separate the children without lecturing or taking sides. When everyone has calmed down, make it clear physical aggression will not be tolerated as a means of solving a problem. If needed, assist children in coming to a solution, but remember: Not every conflict needs to be rehashed. Promote cooperation not competition. Children will naturally compete for parental time and attention. Whenever possible, set up situations for children to cooperate on a common task instead of competing with each other. For example, instead of seeing who can pick up his or her toys the fastest, set a timer and see how quickly they can clean up together. Can they beat their best time? Have fun as a family. Sharing enjoyable activities together will decrease tension and fighting among all family members. In particular, if your children have fun experiences together, they are more likely to have a positive relationship. Acknowledge the need for time apart. Everyone needs time to themselves, away from family dynamics and roles. Arrange a schedule that allows siblings to be apart occasionally. Encourage children to develop relationships and interests unique to them, things they don’t have to share with other family members. Undeniably, sibling rivalry can leave parents wishing for earplugs or a private vacation. Allowing children to experience relationship conflict, deal with jealousy and work toward their own solutions will hone skills needed for success in adulthood. All that just by figuring out whose turn it is to “go first”!